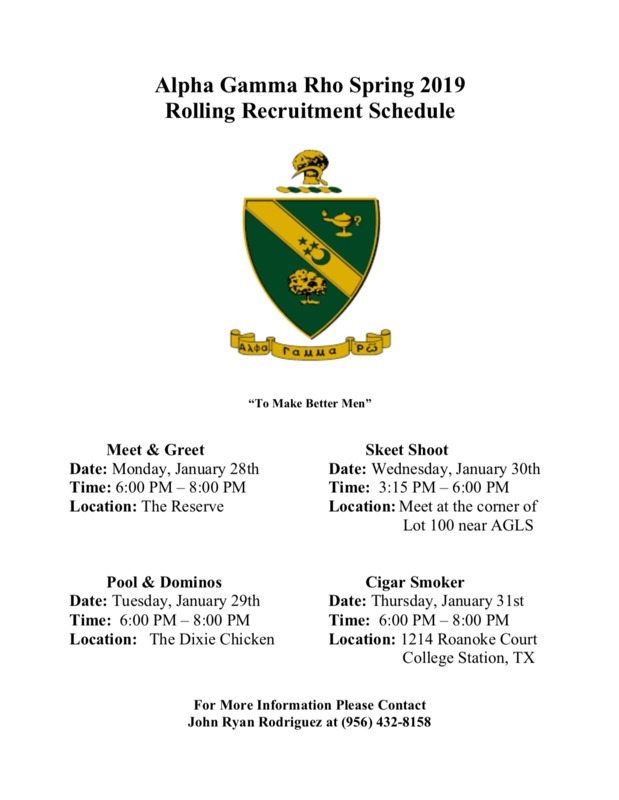 If you are interested in rushing make sure you register at https://tamu.greeklink.com/ and check in for updates. or e-mail recruitment@tamuagr.com for directions or more information. The world needs a few good men. The kind of men who lead by the example of their character and the value of their actions. For more than 100 years, Alpha Gamma Rho has successfully endeavored to make such men, taking the best and making them better, by helping to harness the power within each man to achieve his potential. Alpha Gamma Rho is actually two fraternities in one. We're a social fraternity offering a host of experiences that involve our members in the rich social fabric of college life, plus we're a professional fraternity bonding our members in a common cause to better themselves as they pursue careers in agriculture, food or fiber industries. The Beta Nu chapter takes pride in it's high-caliber members. We hold various professional development events throughout the school year to help educate and better our members for career success. Many of these professional events have been focused around the agricultural industry and have included educational tours, membership development seminars, volunteer events, leadership conventions, and philanthropy events. Alongside these professional experiences, we also hold social events with various sororities and other fraternities. With our social experiences throughout Greek Life, we strive to strengthen our bond with other Aggie Greeks, as well as develop our abilities to communicate effectively in every aspect of life. For every man, the road to personal excellence offers both trial and triumph. The road is never easy. But in AGR, you'll find a group of men of brothers dedicated to helping each other find triumph on that road. If you are ready to make the best of your experience at Texas A&M University, extend your contact network, build your resume, and join a brotherhood with similar passions in agriculture that promotes scholarship, then it's time for you to join Alpha Gamma Rho. 1. Approximately 80% of the top executives in Fortune 500 are fraternity men. 2. 1% of men listed in Who's Who in America are fraternity men. 3. 76% of the current United States Senators and Congressmen are fraternity men. 4. 40 of the 47 Supreme Court Justices since 1910 have been fraternity men. 5. 100 of the 158 cabinet members since 1900 have been fraternity men. 6. All but 3 United States Presidents since 1825 have been fraternity men. Call John Ryan Rodriguez at (956) 432-8158 ‬or e-mail recruitment@tamuagr.com for more information. Please fill out the following. Note: Your information will not be released beyond Alpha Gamma Rho. How did you hear about AGR? Thank you for your interest in Alpha Gamma Rho. A representative from our chapter will be in contact with you shortly.